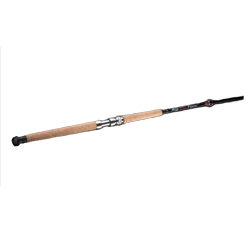 This is a bait casting rod. Built With: 7’6″ S-Glass Blank through construction using the most durable and long lasting rod materials. Cork Handle with a tapered design allowing for easy release from rod holders Transparent gun smoke gray reel seat and guides. Double locking solid aluminum reel seat 8″ cork foregrip handle Oversized Stainless Steel hook keeper perfect for any size hook 9 reinforced stainless steel guides plus tip 10-40 LB. LINE 1-6 OZ.